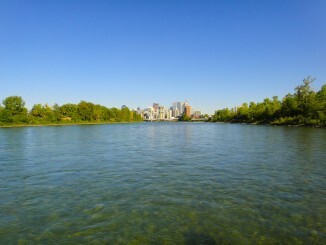 The Bow River is the lifeblood for the city of Calgary and swimming within its clear, cold water are creatures that lure people from across the world. Originating from the Bow Glacier in Banff National Park, the Bow River flows from the mountains through the foothills to the prairies, collecting water from its many tributaries, before joining the Oldman River near Medicine Hat to form the South Saskatchewan River. Although the Bow is the destination for many outdoor recreationalists (including SUP! 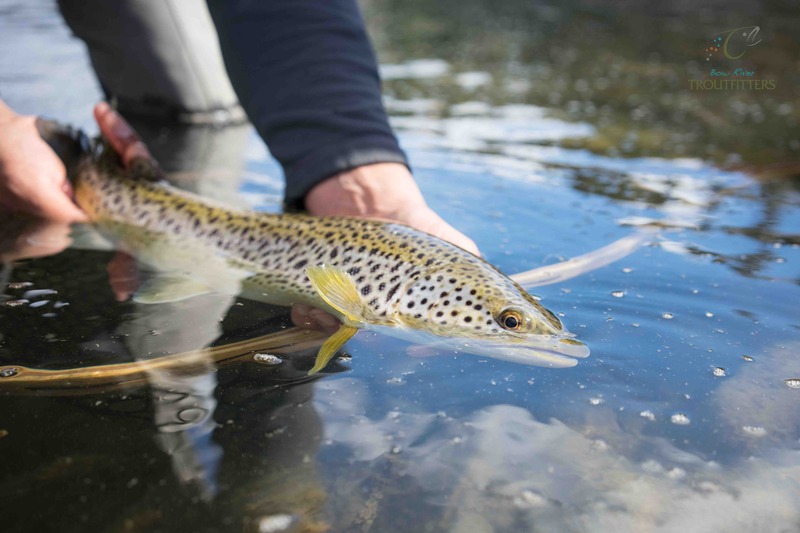 ), it is the different species of trout, more specifically the Brown and Rainbow that attract anglers from all over the globe. Recently I had the pleasure of chatting with the friendly staff from Bow River Troutfitters (BRT) about the Bow River and what makes it so special. 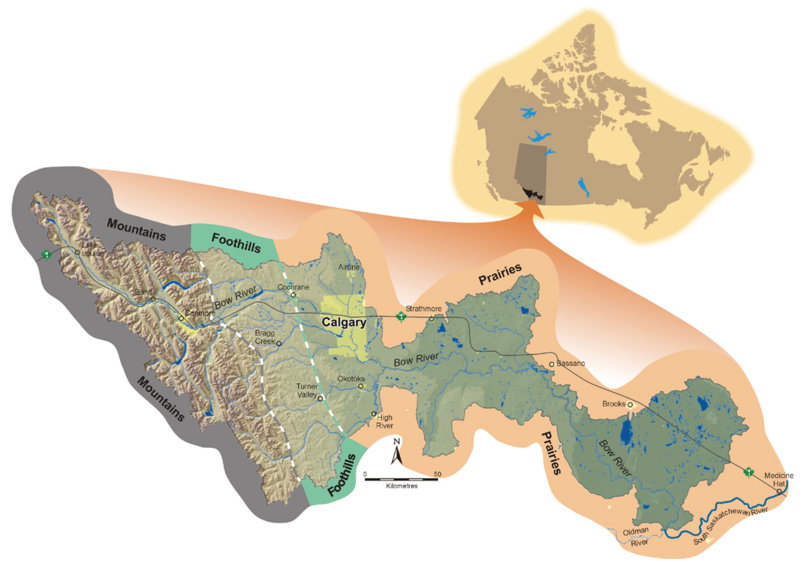 The Bow River Basin. Graphic from The Bow River Fly Fishing website. As a shop and outfitting service we pride ourselves for having a young, energetic, and enthusiastic group of guides and shop staff. Whether we’re out on the Bow guiding a float trip, or in the shop pouring through boxes of flies to get you the best bugs for catching fish on the Bow and our surrounding streams and lakes, we’re super keen to help you out. No matter what you need to be a successful fly angler we are always willing to go out of our way to help you. The Bow River is considered a world-class river because of the quality and quantity of trout found in its waters. The Bow, particularly in its lower stretches (downstream of Glenmore Trail), contains a spectacular density of large trout. 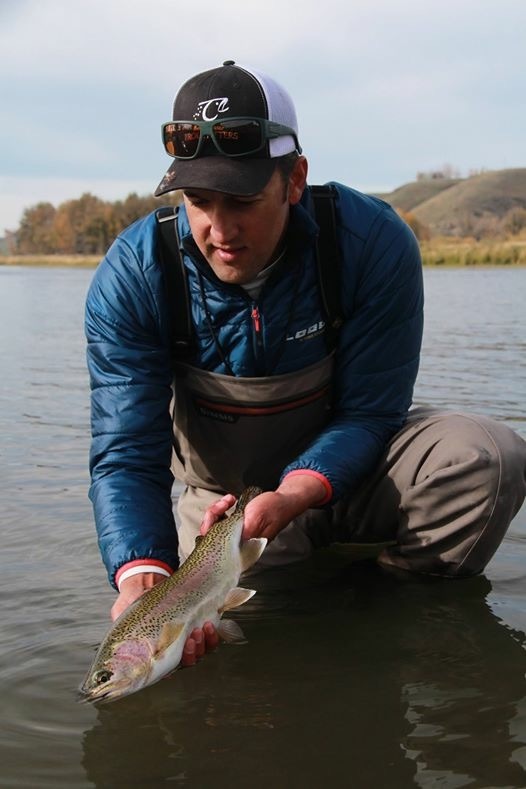 For fly anglers and other anglers alike, the Bow provides opportunities at some of the largest, hardest fighting Brown and Rainbow Trout found in North American rivers. As noted earlier, below where Glenmore Trail crosses the Bow tends to have higher fish densities than the upstream portions. From there, downstream to the Carseland Weir, is where most of the exceptional quality fishing occurs. One of the best parts about this section of the Bow is that much of it runs through the City of Calgary, meaning access is plentiful. One can access the Bow on foot through numerous city parks, such as Sue Higgins Park (formerly Southland Park) or Provincial Parks (i.e. Fish Creek). Both of these are excellent places to reach some very fishy water on the Bow. Downstream of the city, access is more difficult, but areas such as Policeman’s Flats provide public access to beautiful trout water. When we really want to beat the crowds, we tend towards some of the alpine lakes that can be found throughout Kananaskis Country and Banff National Park. If you ever want to find solitude and enjoy the scenery, these alpine lakes are certainly one of the best places to visit and are more than worth the hike. A few of our favourites include Rawson Lake, Invincible Lake, and Tombstone Lakes. Because of their high altitude, these lakes are only free of ice for a few months of the year and generally can’t be fished earlier than mid-July. 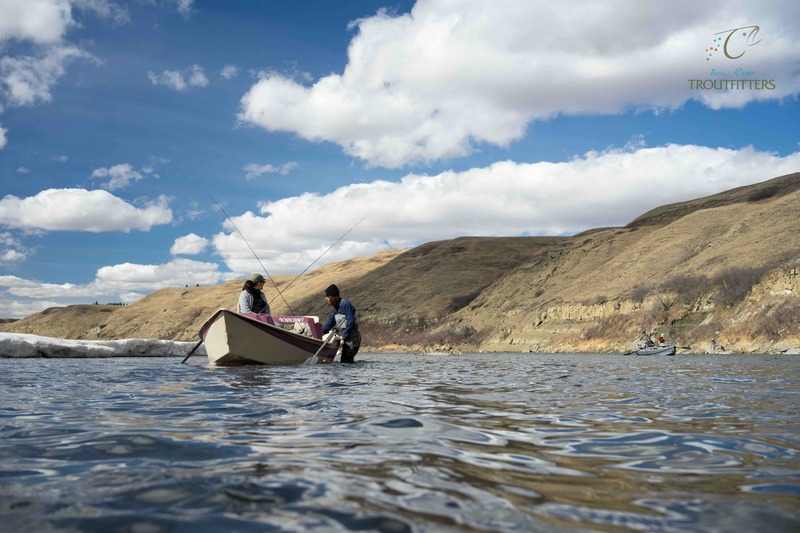 When we want to fish on rivers with this same mountain scenery, we prefer fishing the headwater tributaries of the Bow and Old Man watersheds; the Highwood River and Livingstone River being two great ones. Brown and Rainbow Trout are the main target species on the Bow. Both of these fish species certainly come in large sizes when it comes to river going trout. The biggest trout in the world (ones that break records) nearly always come from lakes, but for those anglers looking to find exceptionally large river going trout, the Bow has fish that will make any angler’s jaw drop. 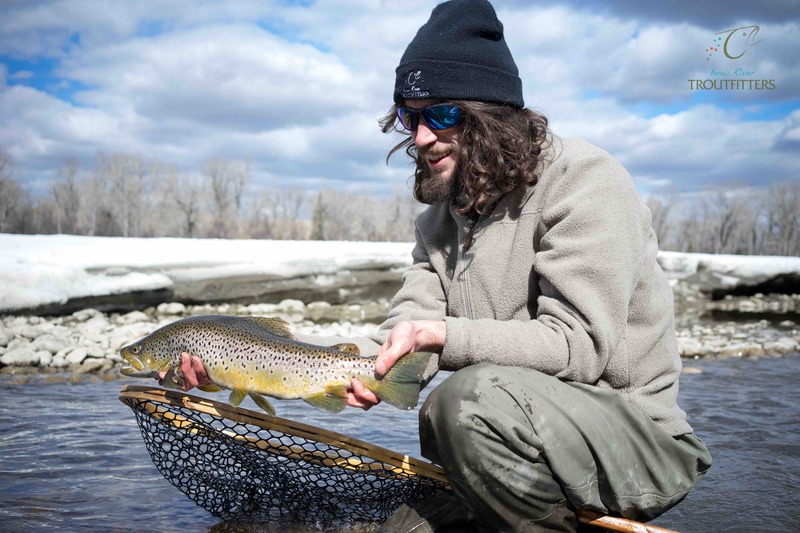 Editor’s Note: Although Brown and Rainbow are the most sought after fish, the Bow River Basin contains numerous other species including, Brook Trout, Northern Pike, Mountain Whitefish, Walleye, Burbot, and Goldeye. The biggest Brown Trout caught in Alberta was 21lbs 14.2oz from the Waterton Reservoir in 2012, while the largest Rainbow Trout was 20lbs 4oz and was caught in Maligne Lake back in 1980. The only trout species caught in a river that holds an Alberta record was a Cutthroat Trout. It was caught in the Castle River in 1988 and weighed 9lbs 9oz. At BRT, our main focus is certainly on trout. It can be tough to choose a specific trout species that we prefer over the others, but in a way, it’s the commonalities between our local trout species that make them so fun to catch. Trout can be taken on many different methods when fly fishing, the most romantic and certainly most fun is with a dry fly. Dry flies are very fun because they involve fooling a trout to swim all of the way to the surface of the water to eat the fly, creating a very visual take. 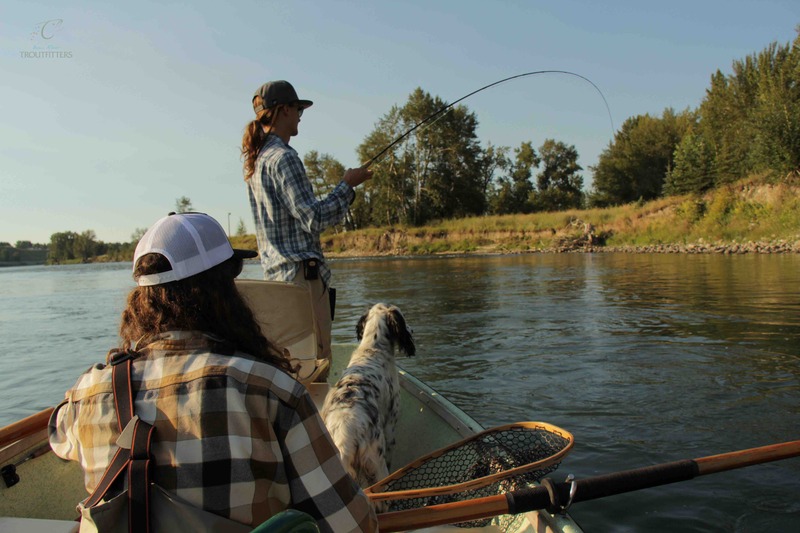 Whether you’re fishing for the Brown, Rainbow, or Cutthroat Trout that are found in and around Calgary, dry fly fishing is our favourite way to do it. Long story short, we love trout! 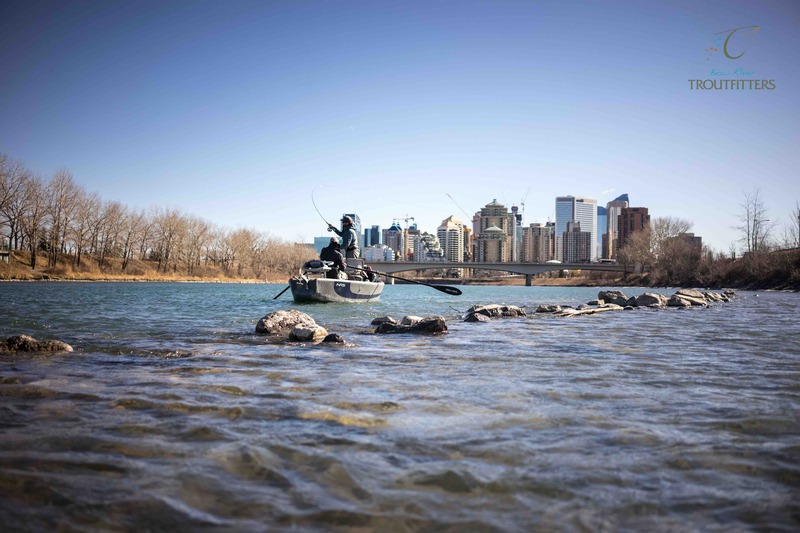 The Bow River through Calgary has a retention limit of one trout less than 35 centimeters in length per person, per day. 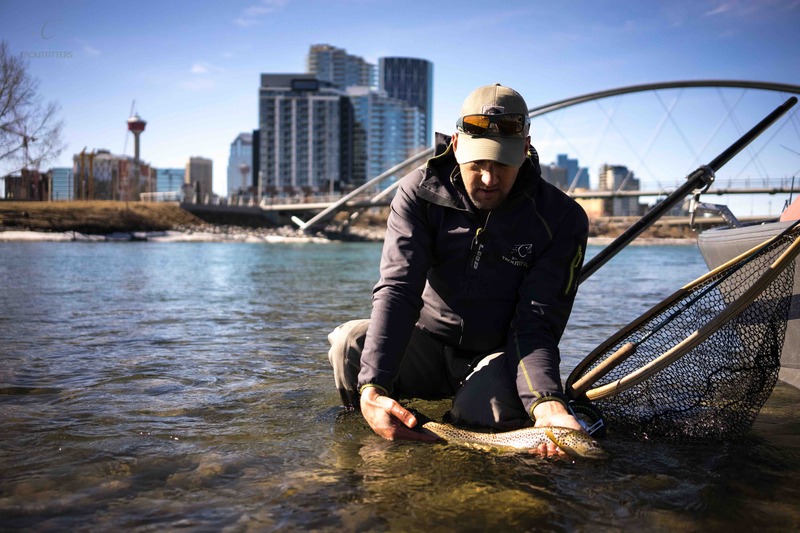 To us, this means that the Bow River is a catch and release fishery. 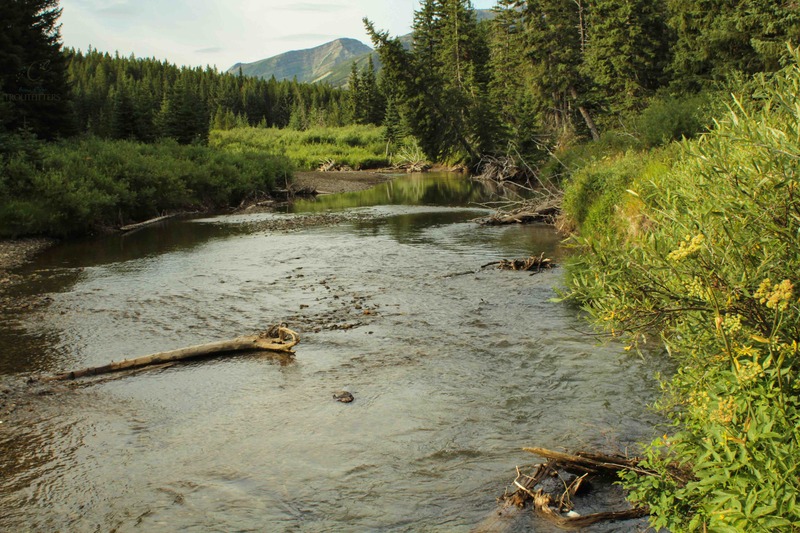 As with other trout anglers throughout Alberta, North America, and the world, we have realized over time that the retention of trout in both rivers and lakes is not sustainable, particularly on rivers such as the Bow, that see very high fishing pressure. 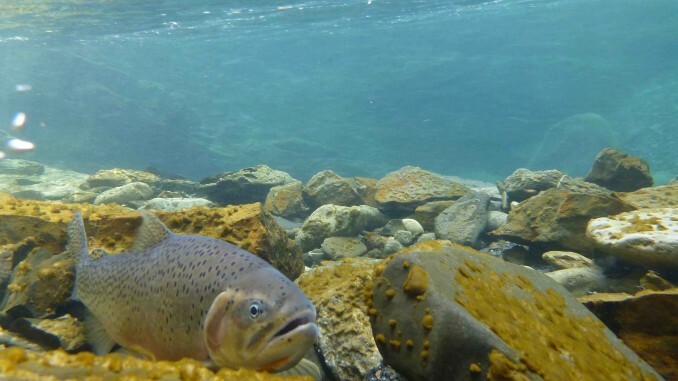 To us, all trout fishing is catch and release; whether the regulations say so or not. If it weren’t for this shared mentality among anglers, the Bow and many of our other incredible trout fisheries would not, by any means, be the world-renowned fisheries we are privileged to have today. Other fishing methods will certainly work well when fishing the Bow. Fishing with spinners, plugs, and spoons using conventional gear such as spinning and baitcasting gear will catch fish. The use of bait is banned on the Bow, bait being defined as any substance that attracts fish by scent or flavour and includes a lure to which scent or flavouring has been added. Yes, people do come from all around the world to fish the Bow. The most recent far off location that I can think of is a couple of friends who travelled from Australia to Alberta to fish on the Bow and some of our other awesome trout waters! This is a surprisingly common occurrence and we have clients who frequently come from the United States to fish the Bow. 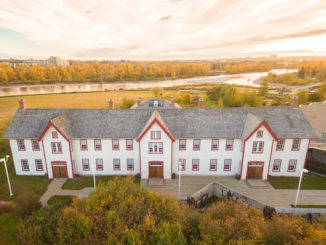 The Bow is split into many sections as it flows from Banff into the South Saskatchewan River, each section having a different set of regulations defining opening and closing dates. Usually the closure dates are based on the times when certain fish species in the river are spawning. If you wish to fish the Bow all year, the section from the Western Headworks Diversion (W.H.D.) Weir (Harvie Passage) to the Carseland Weir is open all year. These regulations are subject to change and it’s always important to have a thorough and up to date understanding of the regulations, which can be found at Alberta Regulations under the Eastern Slopes (ES1) Fish Management Zone. We like to say that fishing can be made as simple or as complicated as the angler likes, but the simplicity side is certainly key for capturing anglers who are just entering the sport. When it comes down to it, all you need is a fly or lure that a fish is willing to eat, a way to get that lure in front of the fish, then the ability to bring that lure, and the fish, back to you when a fish eats the fly. When it comes to fly fishing tackle, this means a fly, a rod, reel, fly line, and leader. Editor’s Note: To legally fish in Alberta you need a Wildlife Identification Number (WiN) and a Fishing License. In order to buy a license you must first possess a WiN card. Both can be purchased online from My Wild Alberta. This can depend on expertise, but for nearly all clients, guided days are definitely considered hands-on. In the shop we consistently say that guided trips are one of the best ways to improve your fly angling skills. Our guides are instructors while out on the water, whether they try to be or not; and we know that the guided trips we outfit are certainly hands-on because of this. Firstly, we recommend taking a beginner fly fishing course. Day-long beginner courses very quickly create a solid foundation for anyone who’s spent a bit of time on the water or for people picking up a rod for the first time. In addition to taking a beginner course to build this initial foundation of skill, simply going fishing is the best way to improve. The search for new fishing waters, new fish species, and elusive fish! No matter where you go fishing, the underwater world is an uncertain one. The uncertainty that comes with not being able to totally predict and see the underwater world makes fishing a consistently embracing and imaginative pastime. Trying to understand the immensely complicated fish we pursue is what keeps bringing us back to the water. I hope the preceding story/interview gave you some insight as to why the Bow River is so much more than just a body of water meandering through our beautiful city. Maybe this has inspired you to pick up a rod and reel for the first time or rekindle your affection for fishing you had as a youngster. Whatever your age, ability, or level of expertise, fishing is a sport that can be enjoyed by all. The following video was created by the team at Hooke, a group of fly fishing enthusiasts from Quebec. The video showcases the staff from Bow River Troutfitters and reveals why they’re so passionate about fishing. Enjoy!! I’d like to take this opportunity to thank the staff at Bow River Troutfitters for their expertise and input. 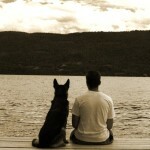 Without their assistance this story wouldn’t have been possible. For additional information about BRT please visit their website. 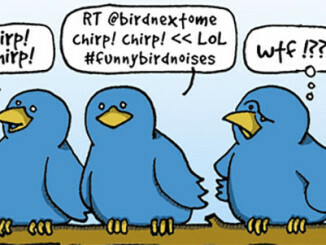 You can also connect with them on Twitter, Facebook and Instagram, or just pop by the shop, they’re always willing to talking fishing!